I always have loved discovering a city by walking around, trying to get lost between two fixed points in time or space. When I discovered Guy Debord’s Theory of the Dérive in 2015, it instantly connected with my personnal experience. Defined in 1956, the concept of dérive (literally drifting) didn’t age but our ways our navigating through the urban space did. We are now following GPS, trying to optimize our paths for a more efficient life. I decided to create a connection between Debord’s dérive and the contemporary machines that we follow blindly every day. I started by analyzing the text, grouping the indications on how, where and with whom to dérive, the ones that describe the dérive itself, and the expected outcomes. Debord’s dérive is about following our senses, our inner voices and our instincts. It is a tool to produce subjectivity, which seems quite in contradiction with our technological world based on data and science. My main question while starting the project was: how to recreate that subjectivity enhancer using a deeply objective tool? Using the smartphone meant translating Debord’s text in an interface. My first decision was to use Debord’s words, as much as I could. Almost all of the words on the screen are his own words, preserving their subjectivity, letting the user decide what sense to give them. No pictograms, only words and fluid colors on the screen. 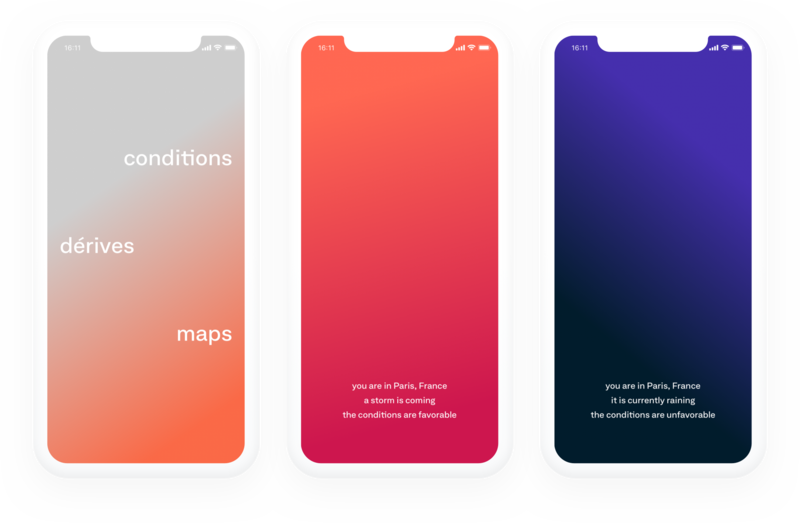 When opening the app, the user has 3 choices on the menu screen: seeing the conditions of the dérive, going on dérive mode and creating maps of his/her dérive. The ideal conditions of the dérive, as defined by Debord, are signaled by a red-orange-pink gradient occupying the entire screen. It is calculated based on the user location and its weather. If the conditions are not favorable the screen turns dark blue. The user can find the same slow moving gradient on the home screen, suggesting quietly that now could be a good time (or not) to start the dérive whenever it opens the app. The warm colors represent how our senses are active during the dérive, in opposition with the dark colors. The navigation is pretty simple, a single click anywhere on the screen allows the user to go back to the main menu. The dérive itself might still seem an abstract exercise for the user at that point. So when clicking on the dérives button the app shows short excerpts of Debord’s text. Clicking "more" allows the user to see a new one. I believe in Debord’s text not as a single unbreakable piece of literature, but more as a list of tips to start the dérive. The goal of the dérive is to forget the smartphone once the user starts the dérive. To force that, once the app is launched, the phone enters a « dérive mode ». Inspired by the airplane mode, the dérive mode keeps the phone screen black at all time. The only way for the user to access the phone is to scratch its surface with his/her finger to reveal the home screen. That simple trick is a way to limit the urge of looking at the phone during the dérive. Once the dérive is over, the user scratches his/her phone’s screen to gain back full control of it. The user can use the map option to create one or see his previous dérive’s maps. 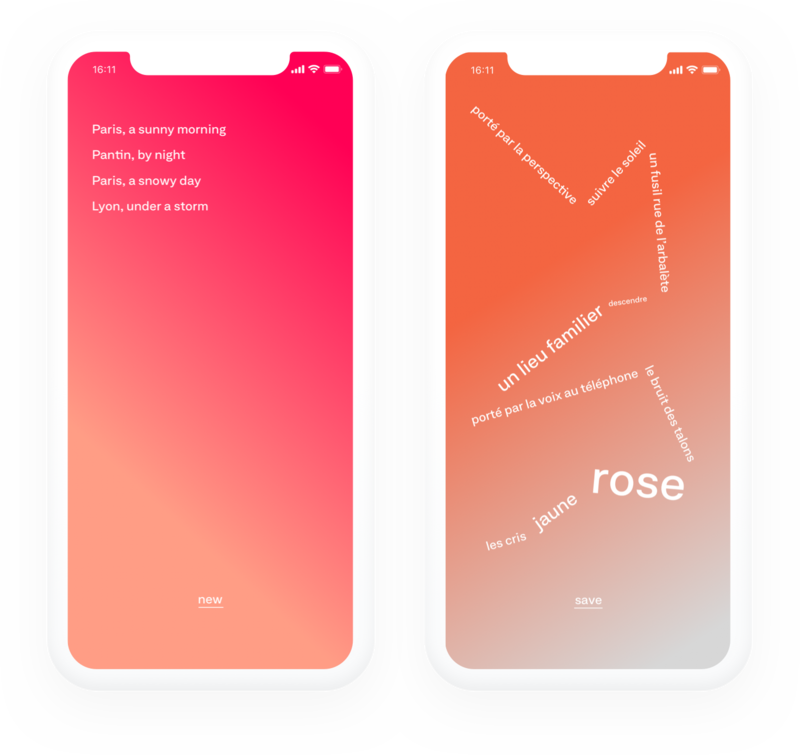 A simple tool lets the user write some words of what he/she remember and create a visual composition with the words on the screen to create a small map of the trip. The map can be saved. 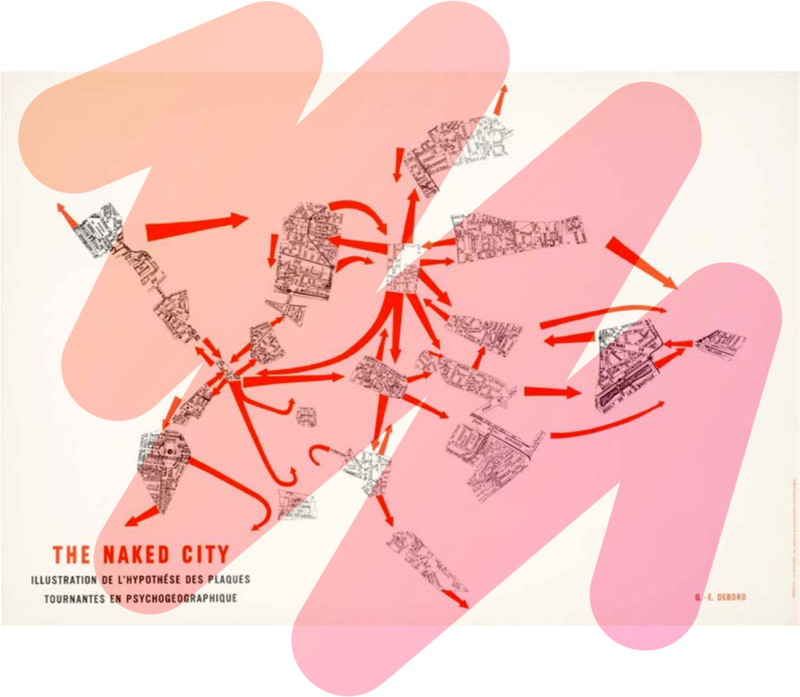 Debord’s theory ends with the idea of building cities from those dérive maps. I believe it would be interesting to start assembling the maps together, mix and compare our perception of the urban space. Translating a very subjective text in a fundamentally objetive tool is a fantastic design exercice. 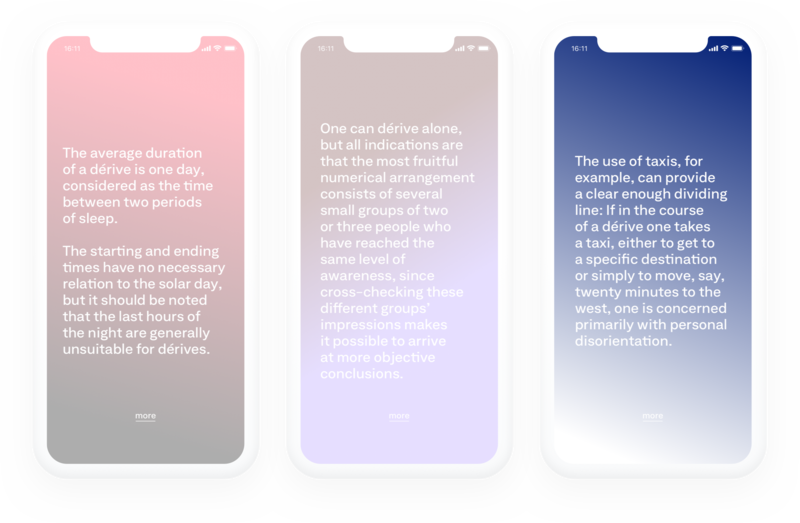 From Debord's essai to an iOS app I questioned here the visual and semiotic languages we use to design apps and digital tools. It was passionating to design without pictograms and buttons (as much as I could), with fluid interactions and no productivity goal. Part of that app is not realistic, and it probably lacks precise indications about the dérive itself to be really interesting for a lot of people, but I would honestly be happy to use such an app.